Nikolay Gavrilovich Chernyshevsky (Russian: Никола́й Гаври́лович Черныше́вский) (July 12, 1828 - October 17, 1889) was a Russian revolutionary democrat, materialist philosopher, literary critic, and socialist (seen by some as a utopian socialist). He was the leader of the revolutionary democratic movement of the 1860s, and was an influence on Vladimir Lenin and Emma Goldman. Chernyshevsky was a founder of Narodism, Russian populism, and agitated for the revolutionary overthrow of the autocracy and the creation of a socialist society. He thought of creating socialism based on the old peasant commune. Chernyshevsky's ideas were heavily influenced by Alexander Herzen, Vissarion Belinsky, and Ludwig Andreas Feuerbach. He saw class struggle as the means of society's forward movement and advocated for the interests of the working people. In his view, the masses were the chief maker of history. He is reputed to have used the phrase "the worse the better" to indicate that the worse the social conditions became for the poor, the more inclined they would be to launch a revolution. 2 What is to be Done? The son of a priest, Chernyshevsky was born in Saratov in 1828, remaining there till 1846. After graduating from Saint Petersburg University in 1850, he taught literature at a gymnasium in Saratov. From 1853 to 1862, he lived in Saint Petersburg. His master's thesis, On the Aesthetic Relations of Art to Reality (1855) and his Essays in the Gogolian Period of Russian Literature marked him as a major literary critic in the vein of Vissarion Belinsky. He helped to usher in the age of Realism, seeing, perhaps short-sightedly, the realistic aspects in the work of Nikolai Gogol to the exclusion of all else. Like Belinsky, his interest was in social justice and social reform. During the reign of the archconservative Nicholas I of Russia, literature presented the only avenue to talk about politics without censure or imprisonment. Chernyshevsky was primarily interested in the utilitarian aspects of art. A materialist and a progressive, he had no use for Zhukovsky and broke with Gogol after the latter's religious crisis. 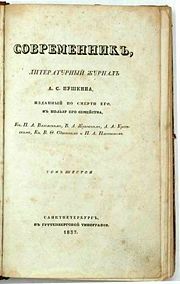 The Title Page of the issue printed after the death of Alexander Pushkin. Chernyshevsky wrote for Sovremennik ("Contemporary"), in which he published his main literary reviews and his essays on philosophy. He would later become the journal's editor. Sovremennik (Russian: "Современник", literally: The Contemporary) was a Russian literary, social and political magazine, published in St.Petersburg in 1836-1866. It came out four times a year in 1836-1843 and once a month after that. The magazine published poetry, prose, critical, historical, ethnographic, and other material. The Sovremennik originated as a private enterprise of Russia's greatest poet, Alexander Pushkin. After Pushkin died, the magazine floundered under his friend Pyotr Pletnyov until Nikolay Nekrasov and Ivan Panayev took over the editorship in 1847. It was Nekrasov who really made the magazine profitable. He enlisted the services of Ivan Turgenev, Ivan Goncharov, Alexander Herzen, and Nikolai Ogaryov, but the virulent realist critic Vissarion Belinsky was responsible for its ideology. His criticism of present-day reality and propaganda of democratic ideas made the journal very popular among the Russian intelligentsia. Sovremennik's circulation was 3,100 copies in 1848. During the reactionary reign of Nicholas I, the journal had to struggle against censorship and complaints of disgruntled aristocracy. Its position grew more complicated after Herzen's emigration (1847) and Belinsky's death (1848). Despite these hardships, Sovremennik published works by best Russian authors of the day: Leo Tolstoy, Turgenev, and Nekrasov. Timofey Granovsky, Sergey Solovyov, and other leading historians were published as well. The period between 1852 and 1862 is considered to be the most brilliant in the history of the journal. Nekrasov managed to strike a deal with its leading contributors, whereby their new works were to be published exclusively by him. As regards to ideology, the Sovremennik grew more radical together with its audience. 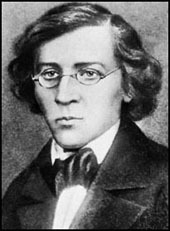 Belinsky was succeeded by Nikolai Chernyshevsky in 1853 and by Nikolai Dobrolyubov. All their principal articles were published in the Sovremennik. 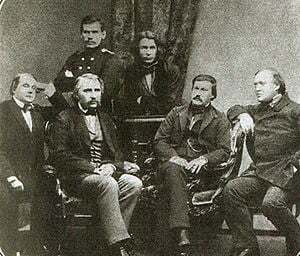 Most popular contributors to Sovremennik in 1856 (left to right): Ivan Goncharov, Ivan Turgenev, Leo Tolstoy, Dmitri Grigorovich, Alexander Druzhinin, and Alexander Ostrovsky. In 1862, Nikolai was arrested and confined in the Fortress of St. Peter and Paul, where he wrote his famous novel, What Is to Be Done? The novel was an inspiration to many later Russian revolutionaries, who sought to emulate the novel's hero, who was wholly dedicated to the revolution, ascetic in his habits, and ruthlessly disciplined, to the point of sleeping on a bed of nails and eating only meat in order to build strength for the Revolution. Among those who took inspiration from the character was Lenin, who named a work of political theory of the same name, and who was ascetic in his personal life (lifting weights, having little time for love, and so on). In 1862, Chernyshevsky was sentenced to civil execution (mock execution), followed by penal servitude (1864-72), and by exile to Vilyuisk, Siberia (1872-83). He died at the age of 61. What is to be Done? (Russian: 'Что делать') (literally, "What to do?" and alternatively translated as "What Shall we Do?") is a novel written by the Chernyshevsky when he was in the Peter and Paul Fortress. It was written in response to "Fathers and Sons" by Ivan Turgenev. That novel's hero, Bazarov, was a radical, an example of the so-called "men of the 60s," the radicals who had replaced the Russian liberals, the so-called "men of the 40s," which included Turgenev himself. Despite his efforts to portray the older generation sympathetically, it was the younger nihilist, Bazarov, who believes in dissecting frogs that captured the public's attention. Despite the success of Turgenev's character, he was not generally well-received by the Russian radicals themselves, who suspected that Turgenev was sneering at them. Chernyshevsky's novel was a response to Turgenev. His novel's hero, named Rakhmetov, was a "real radical" who became an emblem of the philosophical materialism and nobility of Russian radicalism. The novel also expresses, in one character's dream, a society gaining "eternal joy" of an earthly kind. The novel has been called "a handbook of radicalism" and led to the founding of a Land and Liberty (Narodnik) society. Since the author was imprisoned in the Peter and Paul fortress of St.Petersburg while writing the novel, and was to spend most of his remaining years in Siberia, the book had to be smuggled out from his cell. Within the framework of a story of a privileged couple who decide to work for the revolution, and ruthlessly subordinate everything in their lives to the cause, the work furnished a blueprint for the asceticism and dedication unto death which became an ideal of the early socialist underground of the Russian Empire. Chernyshevsky is best known for his novel, and more specifically for its literary and political influence. The book is perhaps best known in the United States for the responses it created than as a novel in its own right. Leo Tolstoy wrote a different What is to be Done? based on moral responsibility. Fyodor Dostoevsky mocked the utilitarianism and utopianism of the novel in Notes from Underground. Vladimir Lenin, however, found it inspiring and named a pamphlet after it. Lenin is said to have read the book five times in one summer, and according to Professor Emeritus of Slavic and Comparative Literature at Stanford, Joseph Frank, "Chernyshevsky's novel, far more than Marx's Capital, supplied the emotional dynamic that eventually went to make the Russian Revolution." The main character of Gide's Les caves du Vatican (En. Lafcadio's Adventures), Lafcadio, bears a striking resemblance to Rakhmetov. American playwright Tony Kushner referenced the book multiple times in his play, Slavs! Vladimir Lenin, Georgi Plekhanov, Alexandra Kollontai, and Rosa Luxemburg were all highly impressed with the book, and it became an official Soviet classic. Lenin titled his tract on revolutionary politics "What is to be Done" in honor of Chernyshevsky. He was inspired by Rakhmetov's revolutionary discipline which had a profound influence on his own personal habits. Vladimir Nabokov's The Gift has the protagonist, Fyodor Godunov-Cherdyntsev, study Chernyshevsky and write the critical biography, The Life of Chernychevski, which represents Chapter Four of the novel. The publication of this work causes a literary scandal. ↑ Middlebury College, What is to be Done? Retrieved September 20, 2008. ↑ Google Documents, Boston theological. Retrieved September 20, 2008. ↑ Martin Amis, Koba the Dread (Miramax, 2002, ISBN 0786868767), 27. Amis, Martin. Koba the Dread. Miramax, 2002. ISBN 0786868767. Brown, Edward J., Russian Literature Since the Revolution. Harvard University Press, 1982. ISBN 0-674-78204-6. Mack, Maynard. The Norton Anthology of World Masterpieces. New York: Norton, 1979. ISBN 9780393950502. This page was last modified on 12 October 2011, at 19:40.